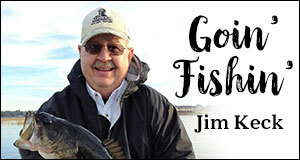 Columnist Jim Keck holds a 3-lb. bass he landed in one of the local lakes. As I’m writing this it is Labor Day and I hope you and your family enjoyed the extra day off this week. It’s been a great weekend and we have some more rain on the way this week. The fishin’ hasn’t been too bad and most folks are catchin’ some bluegills and shellcrackers in Lake Monroe and Lake Woodruff. Also, I’m gettin’ some good results from the Harris Chain and the Kissimmee Chain. Most folks are driftin’ open water with crickets and red worms. You can also try slow trollin’ with Beetle Spins or Road Runners. Once you locate a bucnh of ’em, keep driftin’ back and forth over the same area until they quit bitin’. Once the panfish quit bitin’, start driftin’ again until you locate another school of ’em, and then do the same thing. The bass fishin’ is still doin’ pretty good in most of the lakes and chains in our area. You can catch some bass in the small ponds and lakes by gettin’ on the water early. You need to fish a plastic toad or frog around the shoreline cover. Also try a swim-bait in those same areas, especially if they have lily pads. Also look for some runnin’ water that is flowin’ into the lakes and ponds. You will usually find some bass hangin’ around those typed of areas. The bass will school up and feed on the baitfish, and you will have a blast catchin’ ’em. 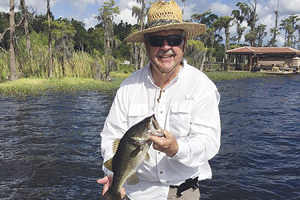 Any type of movin’ water in the mouths of the lakes and canals will usually hold some bass. There has been plenty of movin’ water in the Kissimmee Chain due to the rain. Make sure you fish the mouth of those canals and where the water is flowin’ into the lakes, too. My buddy Rich has been fishin’ in the Harris Chain where you have some movin’ water. He has been catchin’ some nice bass up to 4 lbs. each on speed worms around or near the movin’ water. Captain Paul Solomon has been catchin’ some nice bass in the Butler Chain with his clients. They have caught most of their bass by driftin’ shiners around the submerged hydrilla and eel-grass beds. They have been catchin’ some bass on speed worms as well. Rick and I also got a chance to do some fishin’ this past week. We fished the Butler Chain again this week. It was a little tougher this week. We had winds from the east with partly cloudy skies. It was a little choppy on the water but we managed to catch and release 12 bass up to 3 lbs. each. We caught most of our bass on slow-sinkin’ Senko-type baits and swim-jigs. We also caught a couple of bass on swim-baits fished around the pads and stick-ups. We saw plenty of baitfish and some small bass bustin’ on ’em. Those bass were more interested in the baitfish than what we were usin’. Get on the water early and fish the shoreline cover. Once the early-mornin’ bite is over, move to deeper water and fish the submerged hydrilla and eel-grass beds. I hope you and your family had a great Labor Day and I’ll see ya next week. Tip of the week: movin’ water.